For the past few years Amanda and I have kind of made it a tradition to head over to Arches National Park near the Christmas holiday. This year we were able to get down there the Sunday before. 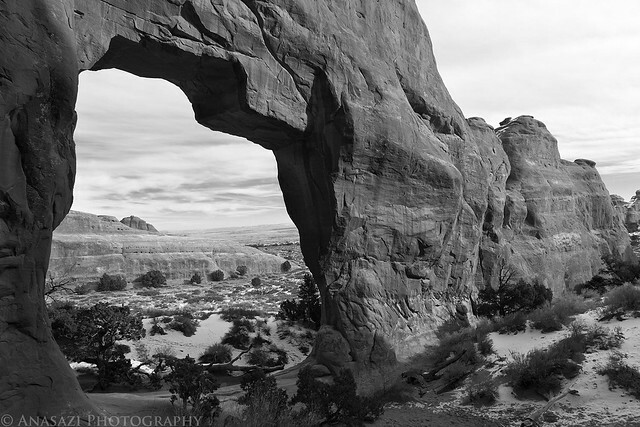 The first thing we do when we get to the park is drive over to Devils Garden and hike over to Landscape Arch, just to make sure it’s still there…it is! After hiking to Landscape Arch we also visited Pine Tree Arch, Tunnel Arch, Sand Dune Arch, Broken Arch and the Windows section of the park. 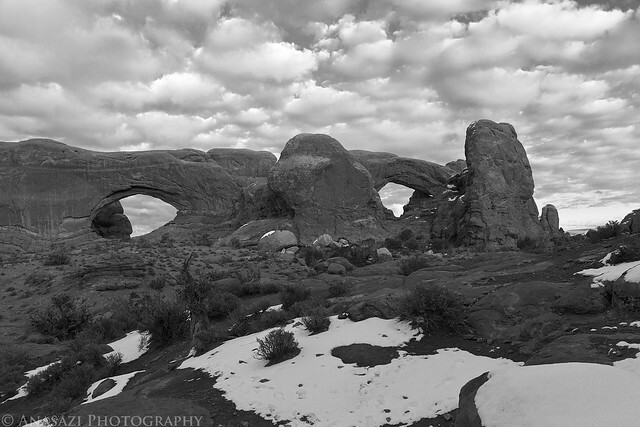 We love visiting Arches in the middle of the winter since there are so few people there. Usually the trails are covered with snow and ice which can make things slippery, but because of our warmer winter there wasn’t much snow or ice around this year. 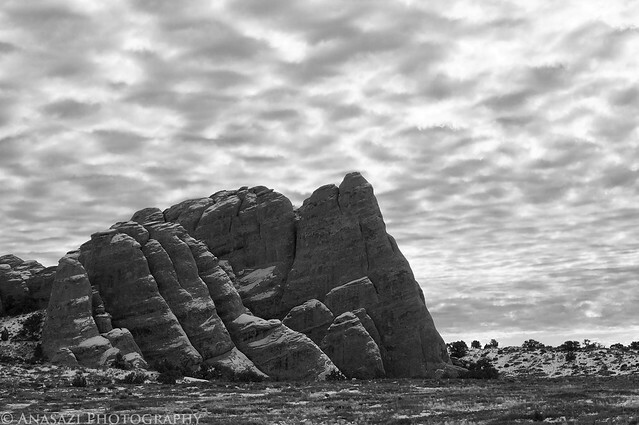 I decided to process most of the images from the day in black and white. It’s something a little different for me, and also something I need more practice doing. Feel free to let me know what you think in the comments below. 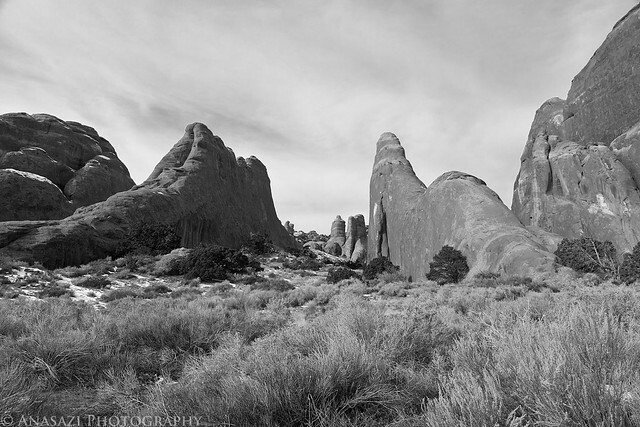 Fins in the Devils Garden area as we hiked to Landscape Arch. The view through Pine Tree Arch. 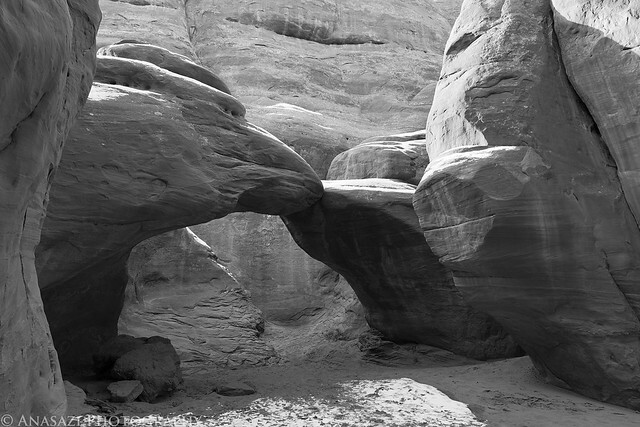 In the warmer months, Sand Dune Arch is usually crawling with people. We had it all to ourselves today. 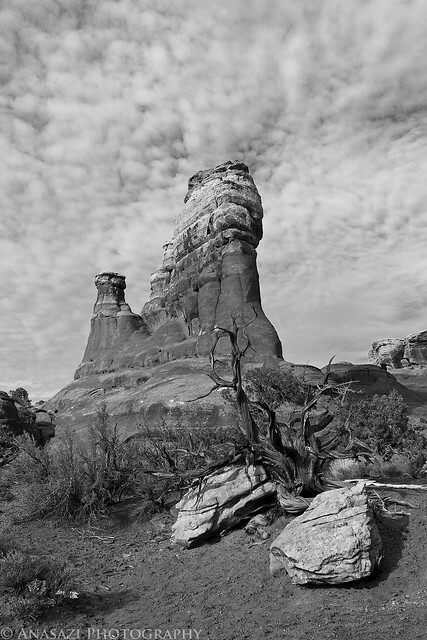 A sandstone tower along the trail to Broken Arch. 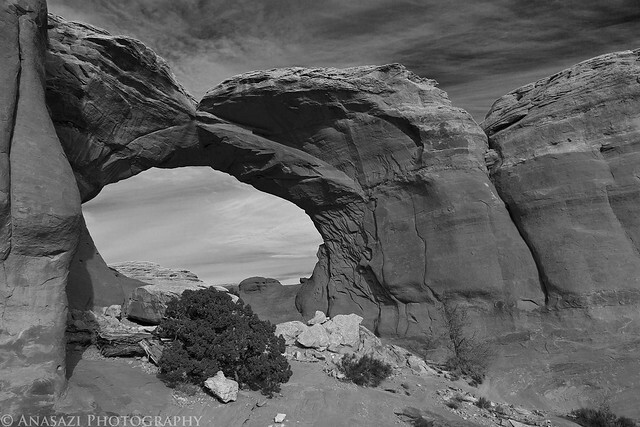 It’s been a few years since we last visited Broken Arch. It was nice to get back again. Fins and interesting clouds in the sky. The North and South Windows. A view of the South Window through Turret Arch. Now let’s finish off this trip report with a little color! 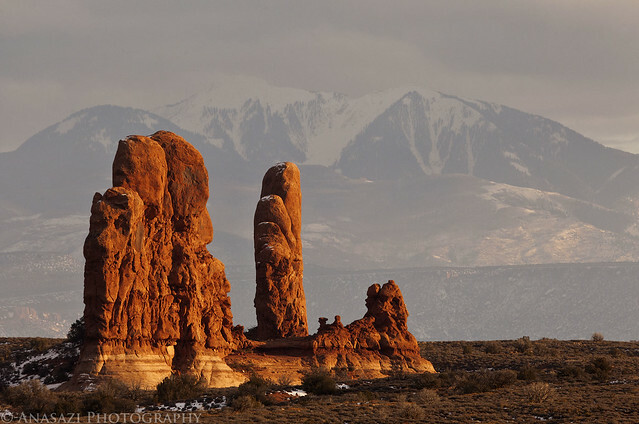 Here’s a few sandstone spires lit up by the late afternoon sun with the La Sal Mountains as the backdrop. 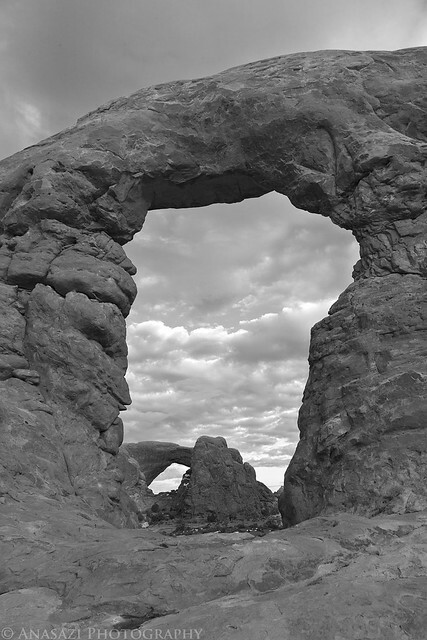 As we drove over to the Windows Section of the park to catch the sunset, the sun peeked through a small opening in the clouds and lit up Turret Arch and many other sandstone formations near it. I pulled the Jeep over and took a few photos before the sun hid behind the clouds again. These formations were only lit up for a matter of minutes. Once the sun was hidden again, it never made another appearance so I was glad I stopped for this photo. What else can I say? 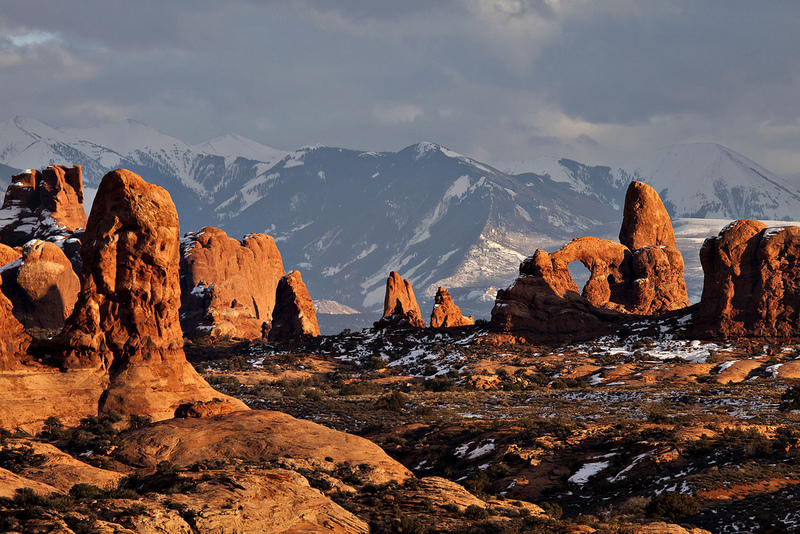 We had a great day in Arches as usual!